Let's be real... I am a creature of habit. I have my schedule(s) and I like need to stick to it. I try to do my long runs Friday morning. I like that time because the roads aren't too crazy and I can get it done and out of the way before the weekend. I want to try and spend as much time with my hubby when he's not working as I can, so not having a 3-4 hour run when he is home is MUCH preferred. With that being said, my training calendar had 12 miles for Friday. 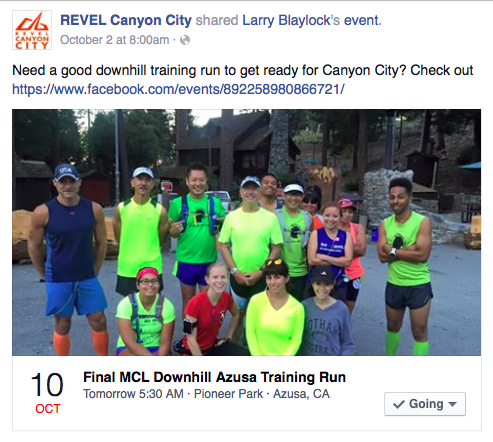 I was planning on knocking it out early Friday (seeing as yet ANOTHER triple digit weekend was in the forecast), but then I saw an event on the REVEL Canyon City Facebook page. I have been slightly freaked out about the downhill of the course (running downhill sounds easy, till you remember your quads will be ON FIRE, especially after a 4,200 feet elevation loss within the first 13 miles), so when I saw this I knew I had to try to make it happen. A 5:30am start means I would have to leave my place by 3:30/3:45, but I thought it would be worth it to have the opportunity to run the first 16 miles of the course and get a little more confident on what I would see/ feel on race day. I swapped my Friday 12-miler and my Saturday rest day for a Friday rest day and a Saturday 16-miler. My body has been craving rest (or at least it hasn't wanted to go fast while running so I think it might need a slight break), so laying by the pool for a few hours Friday morning was JUST what I needed! Friday afternoon I made my way up to Long Beach. As part of my commitment of being a Los Angeles Marathon Ambassador, we are required to volunteer at some of the local races so we can spread the word about the LAM and get runners signed up. Friday from 4-7 was my shift so I hung out at the Long Beach Marathon Expo and chatted it up about running! Let's just say the alarm came EARLY on Saturday morning (especially not getting home until close to 9pm from LB). 3am wake up calls (which I ended up getting out of bed by 2:58am - always up before the alarm rings) are never easy (especially when technically you are able to finish your workout in the time you will be driving to and from the run), but the experience and confidence gained was going to be WELL WORTH the few extra hours of sleep I was missing. Up what felt like minutes after I went to bed, bright colors on, water bottle filled, PROBAR BASE bar for the car, and I was OFF! The traffic on the way up wasn't bad. I ended up leaving the house around 3:40am and got to Pioneer Park around 5:05am. We met at a local park then caravanned (followed one another in our own cars) to mile marker 16 on the course and then carpooled (jumped in as few cars as possible) to get up to the top of the hill - Crystal Lake. Although we officially met at the park at 5:30am, we weren't actually up to the top until closer to 6:30 due to the car swaps and then stopping a couple times up the hill to drop water and fuel at the make-shift aid stations. Something to note - it was at least 20 degrees (if not more) cooler at the top than when we left the local park (you get ZERO cell reception once you start climbing the hills so I couldn't get an official reading on my weather app, but know that at the park we were almost sweating and at the top we were starting to shiver). I would HIGHLY recommend anyone running this race to dress in layers (and layers you are okay ditching at the aid stations on the way down). I heard that last year they actually gave out Mylar blankets and throw away gloves with packet pick-up because the temps were slated to be in the 30s at the start. Head to your local thrift store to pick up some easily removable layers NOW (especially if you are used to these HOT temps we have been having lately). The run was hosted by My Coach Larry, who opened the event to anyone who wanted to join (how amazing is that?!). He is a SPEED DEMON and now coaches us other runners. Many of the runners on his team actually had longer than a 16 mile run, so were doing a few miles at the top of the hill before beginning the descent. Since I actually only had 12 miles on the calendar (don't worry - my second 20-miler of the training cycle is on Tuesday), I figured I use the potty and then hit the road (seeing as I had a rather far drive home afterwards). 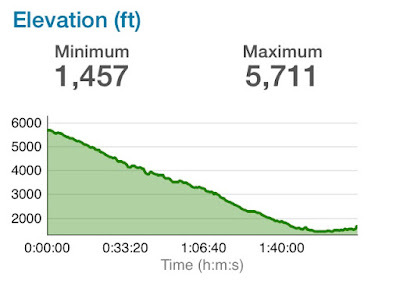 Like I mentioned before, I was pretty worried about the downhills. 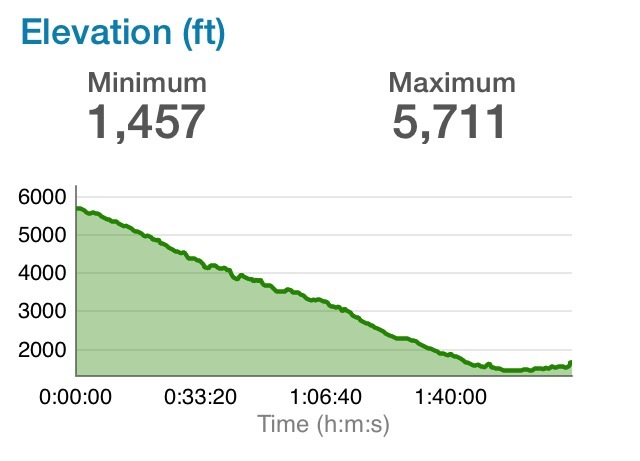 The elevation chart makes it look like you are falling down a mountain. And, if that was in fact the case, I wasn't sure how my legs would hold up after all that pounding when we hit the flat or UPHILL areas (the second half has a net loss, but there are definitely rolling hills to be aware of along the way). I decided I would try and reign in my pace a bit. I didn't want to go out too fast and trash my legs, but I also wanted to get a feel for the decline (not to mention, I wanted to be able to take in the surroundings in case on race day I am too focused to look around at the beauty beside me). Here's a quick video of the sunrise (and you can see what the "course" is - just a two lane road down the mountain). With the weaving down the mountain, none of the road is very flat. It is angled as you turn down the hill a bit. I never really felt like I was running off kilter in one direction too long (so at least in the end you still feel like you evenly wrecked both sides ;)), but something to keep in mind. Also, it isn't a freshly paved road by any means, so watch for pot holes, gravel, falling rocks, etc. Gotta say, I am STOKED that the course will be closed on race day. It was a little sketchy running it with little to zero shoulder along the road while bikes, vehicles and SKATEBOARDS were out there. Yes, while we were running down it, there were guys out there speed skating it. It was pretty amazing to watch (I would be pooping my pants going that fast). of bobsledding! So awesome, but I would be FREAKED out! Honestly, I was actually a little disappointed that the pull didn't feel stronger. I guess I was hoping I would be able to lift my feet and gravity would just pull me down the mountain, making the run effortless, but you definitely still had to work for the mileage. Other than stopping at a few picture-ops (sunrise and then the one with an aid station sign), I chugged along the entire ~16 miles. I am super thankful that I was able to get out on the course this morning. It showed me that I need to continue to practice my downhills so I can increase my speed more. Thankfully I still have a month before the race (holy crapoly - how is there only 4 weeks left before I race this one?!). The run itself was decent. I kept an average pace of just over 8:20/mile (which is great for a long run, not so great for a downhill run). I think the run was invaluable, even if it shook my confidence a bit when I looked at my pace. I now know what to expect when race day arrives. Have you ever run a portion of a race course to get ready for the big day? It's awesome that you got a chance to actually run the course. Maybe it will help with any race day nerves? Great job! What a great opportunity to run the course! Thanks a ton for the blog post, Carlee. I'm running and hoping for a BQ. I've been running some downhills, but have thought about running the course, but was afraid that cars were the only ones on the road. Now I know that's not the case! Going to try it next Saturday. Good luck on the 7th! If I see you, I'll thank you in person.